Gorgeous kid made necklace from glue and paint. This is a fun and easy handmade gift idea that kids can make for somebody special. You guys, Christmas is coming and it’s time to start thinking about all of the lovely hand made gifts you’re going to be making for friends, family and loved ones. 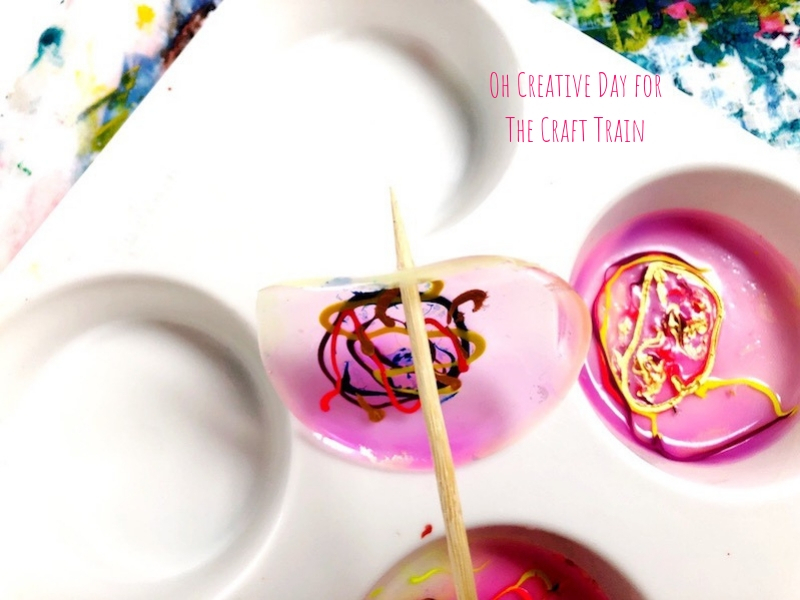 Over the next month on The Craft Train I’m going to be sharing a lot of easy hand made gift ideas you and the kids can make at home. By the end of the month you should be able to find something you could make for Grandma, Dad, teachers, school friends and even for the dog. We all know that hand made gifts are the best because they’re packed with even more love and usually cost less than something store-bought. 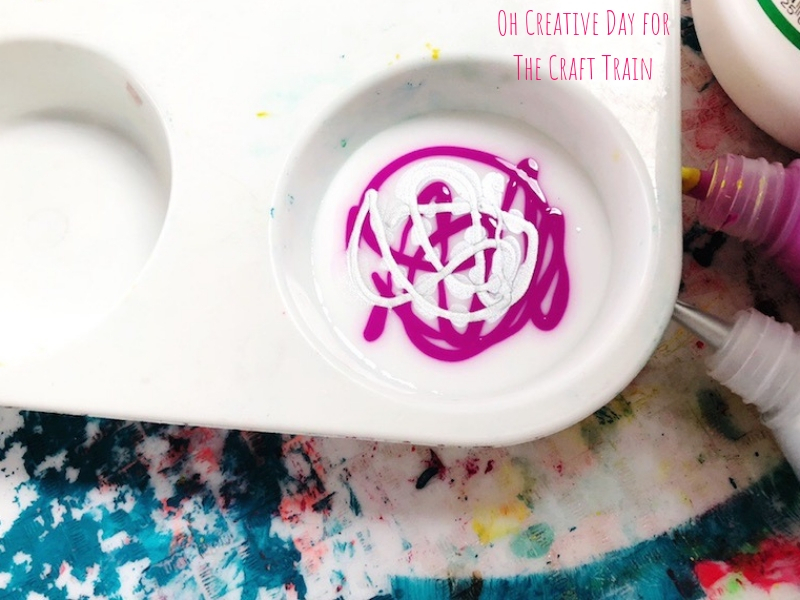 Today I’m handing over to Shannon from Oh Creative Day who is showing us how to make some kid-made necklaces from glue and paint. 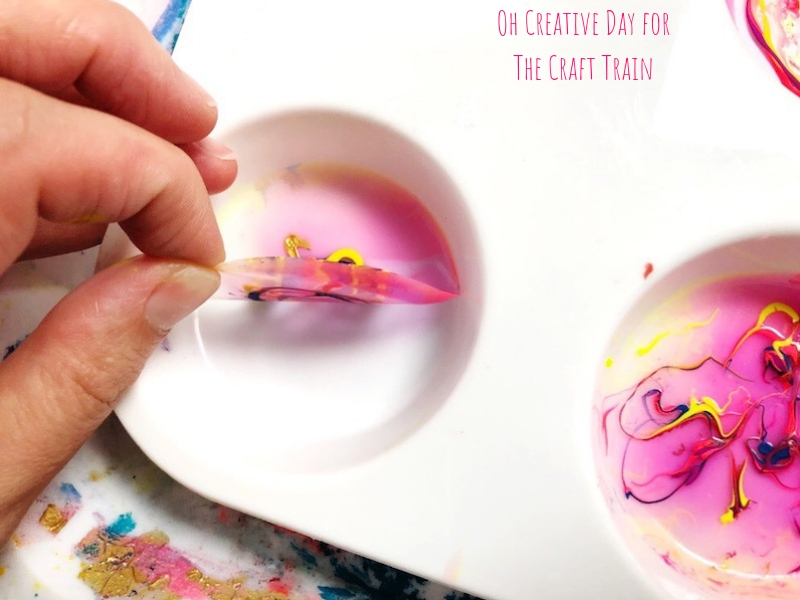 So creative, easy and fun – and doesn’t the end result look fabulous too! 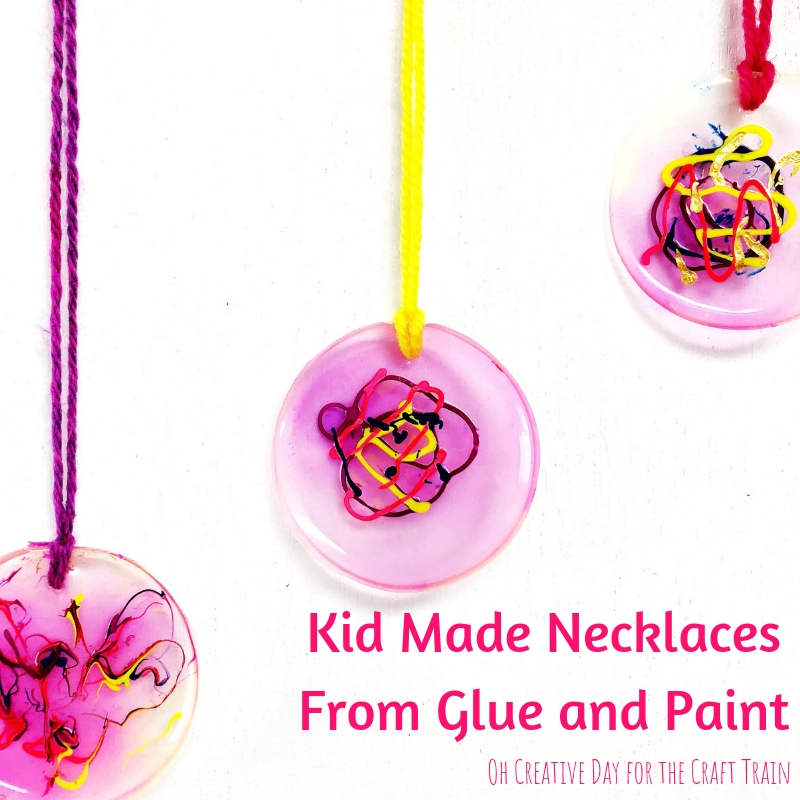 These kid made necklaces from glue and paint come with my 5-year-old’s seal of approval. After making them, she declared that she was making one as a gift for everybody she knew. A definite winner! N.B This project requires patience. It took about a week for our creations to dry. 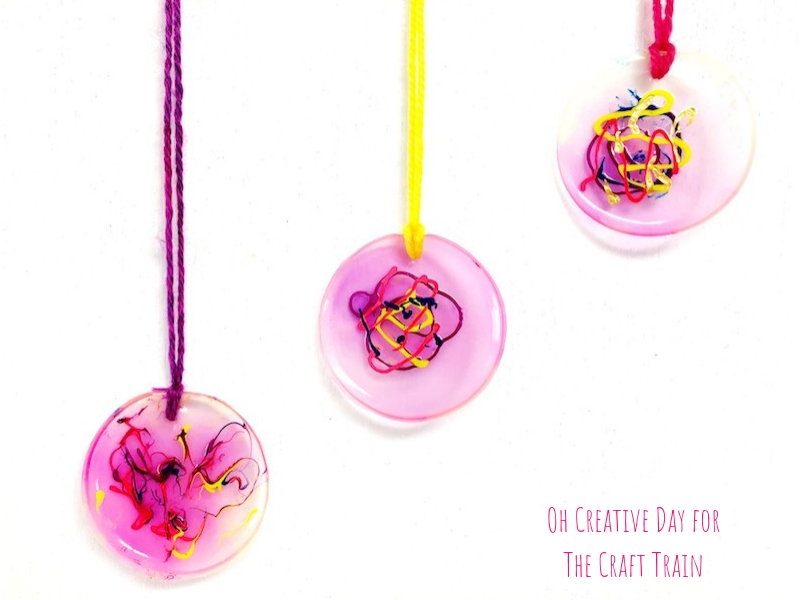 Pour about .5cm of craft glue into a circular mould. The circles of our plastic paint palette measure roughly 7cm in diameter. We used IKEA Mala in this project. We love these paints because they come in little bottles that are perfect for little hands to squeeze. We drizzled and squeezed the paints into different lines. The purple paint turned our white glue violet as it dried, which was a nice surprise. If you do not have these paints, you can water down some acrylic paints. Then drizzle your paint onto the glue. You could use a skewer to gently marble the colours. It’s fun to experiment! You could also scatter some sequins or pom poms into the glue. Just make sure they are embedded well. This is the hard part. You now have to set aside your glue creations until they dry. It took about a week for us. How will you know when they are dry enough? Lightly touch the centre of the circle. No glue will come away if it’s dry. Another sign is that your pendant should pull ever-so-slightly away from the edge of the circular mould. Run a sharp knife around the edge of your pendant to loosen it. Gently peel the pendant away from the mould. Use a skewer to poke a hole through the pendant. String some yarn through the hole and fasten with a knot. 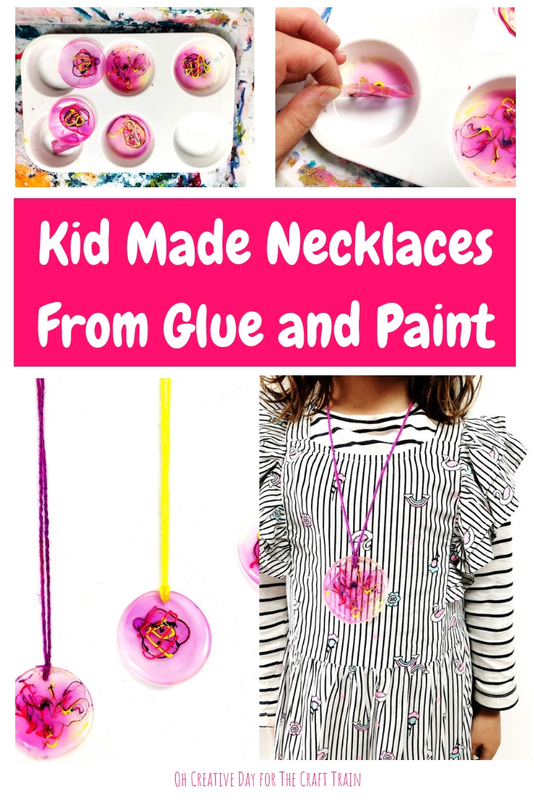 Your kid made necklace from glue and paint is now ready to wear! Shannon is a mum and a teacher who believes that reading and creative outlets are as important as breathing. She harbours the desire to be a published picture book author. But first she needs to figure out what's on for dinner. 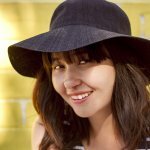 Shannon blogs at Oh Creative Day where she celebrates her perfectly imperfect attempts to live a creative life. AKA trying to remain sane whilst raising 3 kids under 4. She has an unhealthy addiction to Instagram, coffee and pom poms and is vehemently opposed to glitter. According to her husband, she cannot pack the dishwasher properly. Like, ever. This actually looks so good. Can’t believe it’s just made from paint and PVA glue.